We’re delighted to bring seven new homes to Darlington Lane in Stockton. The £930,000 scheme was supported by a Homes England grant of £300,000. The site was brought to us and developed by P.F Burridge, this is the first new build scheme they have built for us, but they have worked for North Star previously as maintenance contractors. 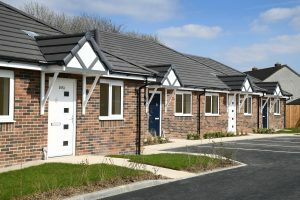 The homes have been developed on a brownfield site, and provide much needed homes for older people. The scheme consists of seven two-bedroom bungalows, designed for people over 55.